Honey is a sweet and viscous liquid produced by bees from the nectar of flowers . The flavor and color of the honey is largely determined by the type of flowers from which the nectar is gathered. Common flavours of honey include orange blossom honey, tupelo honey, clover honey, blackberry, and blueberry honey. In Australia, Tasmanian leatherwood honey is considered a delicacy for its unique flavour. Manuka honey from New Zealand is said by some to have more healing properties than other honeys, therefore sells at a premium price. 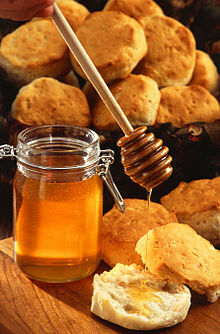 The main uses of honey are in cooking, baking, spreading on bread or toast, and adding to various beverages such as tea . Because honey is hygroscopic (drawing moisture from the air), a small quantity of honey added to a pastry recipe will prevent it from becoming stale. Raw honey also contains enzymes that help in its digestion, as well as several vitamins and antioxidants. Eating wild honey from near your home can help build up resistance to hayfever and other pollen allergies. Honey is, however, not always healthy. Because it is gathered from flowers in the wild, there are certain times and places when the honey produced is highly toxic. Rhododendrons and azaleas have nectar that is highly poisonous to humans although harmless to bees, producing deadly honey. In some areas of the world the hives are emptied immediately after the flowering season and cleaned of any residue to prevent accidental poisoning. Such poison honey is very rarely, if ever, encountered in the United States. The shape of the Azalea flower makes access to nectar difficult for honeybees, and during the time at which Azaleas bloom there are almost always other flowers in bloom that are more appealing to the honeybee. Honey (as well as other sweeteners) is also potentially extremely dangerous for infants. This is because botulism spores are among the few bacteria that survive in honey. While these spores are harmless to adults, an infant's digestive system is not yet developed enough to destroy them and the spores could potentially cause infant botulism. For this reason, it is advised that neither honey, nor any other sweetener, should be given to children under the age of 18 months. Honey does not spoil. Because of its high sugar concentration, it kills bacteria by osmotically lysing them. Natural airborne yeasts can not become active in it because the moisture content is too low. Natural, raw, honey varies from 14% to 18% moisture content. As long as the moisture content remains under 18% nothing will grow in honey. 1 volume unit of honey = 1.67 volume units of granulated cane sugar in equivalent sweetening power. As a general guide, when using honey recipes, use less of honey because it is almost twice as sweet as sugar. Replace one cup of sugar for half a cup of honey, and because honey is hygroscopic (meaning it attracts water), reduce the amount of liquid in the recipe by 1/4 cup for each cup of honey added. Give longer time for beating and more vigorous beating compared to sugar recipes, and when baking with honey. Reduce the oven temperature by 25 degrees Fahrenheit. Honey batter becomes crisp and browns faster than sugar batter. The floral variety of the honey should be considered when cooking with honey since honey will impart some of its flavor. This page was last edited on 30 June 2010, at 09:07.